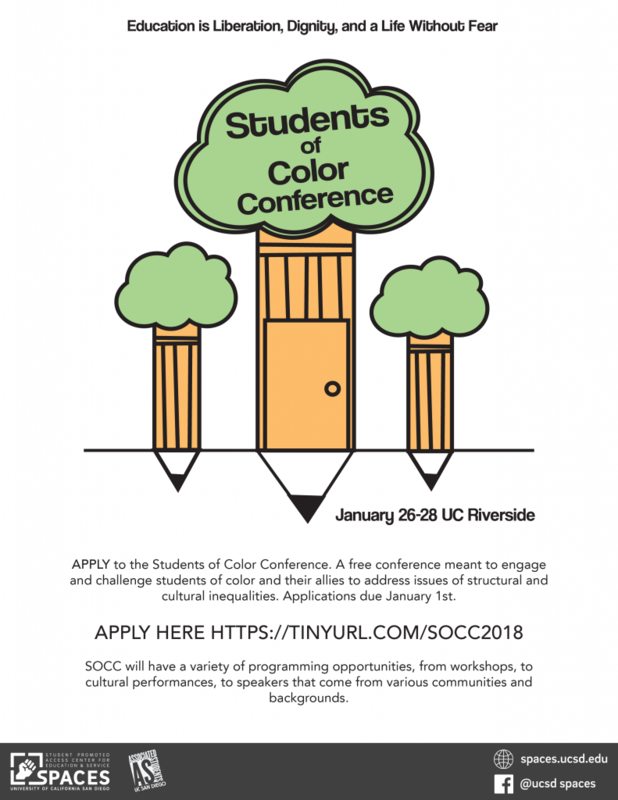 The Associated Students Office of External Affairs and the Student Promoted Access Center for Education and Service (SPACES) will be taking UCSD students to UCSA’s 27th Students of Color Conference (SOCC). SOCC is one of the three conferences hosted by the University of California Student Association. As UCSA’s oldest and largest conference, it means to provide a safe space for students across the UC System to discuss issues students of color face on individual campuses. Through various workshops, caucuses, break-outs and entertainment activities, students are given the chance to participate in community based knowledge sharing to develop a community of solidarity and alliance. To apply to SOCC 2018, click here!